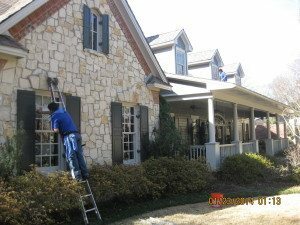 We provide wind ow cleaning, gutter cleaning, power washing and ceiling fan cleaning to your home. We take great care and consideration to your home and your landscape. Allshine’s windo w cleaning service offers weekly, bi-weekly, quarterly or annual maintenance schedules for window cleaning and related services. We will customize a service schedule that fits your individual needs. If you are looking for a one time restoration cleaning, give us the opportunity to show you how professional a company can be. Allshine prides itself on being known as the window cleaning company who offers the most exceptional quality and prompt service.